Last week The Guardian had a piece on the “first science fiction book,” an alchemy fantasy from 1617. I haven’t read The Chemical Wedding (though there’s a Kickstarter, now funded with 60k, that’s producing a new edition), but I was instantly skeptical of the “first” claim, so took to Twitter to ask for ideas of precursors. This is very much where I stand as a medievalist. When someone claims a”first” status just after the Middle Ages, I am immediately suspect and defensive, because as a historian I pursue continuities over radical over-determined periodized change (I’m a lumper, not a splitter). It may be possible to come up with a definition of “science fiction novel” that only The Chemical Wedding and subsequent books fits, but it doesn’t involve “science” or “fiction” or “novel” putting the three together. O’Brien looks at the medieval meanings of all three words, and as always, go read the whole post! Finally: I agree with O’Brien that the need to be first, the need to define YOUR FIELD, YOUR PERIOD, YOUR BOOK as first, as devoid of contact with that which came before, is an epistemological problem. Some of this stems from academia itself – we reward “firsts” and smile politely at “continuity,” “incremental change,” or same-as-it-ever-was. You don’t win big prizes for locating a lack of change. There’s a newish piece in Pacific Standard, a magazine for which I write, that criticizes the neurodiversity movement as being focused on a tiny group of super high functioning autistic folks. You can read it here. “The Autistic Academic” blog has written an excellent response. You can read it here. Please link to other responses in the comments! Like every other anti-neurodiversity-movement piece I have read to date, this one gets the fundamentals of the neurodiversity movement very, very wrong. So wrong that it doesn’t even function as a rebuttal of the neurodiversity movement – it functions as a rebuttal of a straw movement inside the author’s head. This article is Gwendolyn Kansen talking to Gwendolyn Kansen. I’m not going to ask what Kansen intends to mean by “high-functioning.” The neurodiversity movement has exactly the same thing to say about “less inspirational” autistics that it has to say about “more inspirational” ones: Autistic people are human beings who deserve to have their full set of human rights respected. The piece effectively moves through Kansen’s claims and keeps just repeating the refrain – human beings, human rights. Anti-neurodiversity rhetoric tends to say that it only serves a small segment of people with intellectual or developmental disabilities. This is entirely wrong. The fundamentals of the neurodiversity movement focuses on universalities and breaking the high/low functioning discourse. As always, please click over and read the whole thing. This is the lede. Notice how from the opening, it’s centering the mother’s justification for her horrific acts. Caregiver murder is my next project (not starting until Fall, really). But I’m watching. From 2014: Me on London McCabe’s death and the need for victim-centered narratives. I’ve been inching away from the blue book for years, but it’s time to go cold turkey and match my praxis to my principles. Whatever pedagogical gains the in-class test might bring — and I’ll argue they are few and increasingly less relevant — I can no longer justify forcing people with disabilities to disclose their conditions in order to receive basic test-related accommodations…. It’s become routine, rather than rare, for students to begin the semester by presenting their professors with documented requests for accommodation. If there were important benefits to taking HISTORY classes in the room, then the accommodation model might be relevant. There aren’t, I argue, so I’m done. That doesn’t mean you have to be done, but I guess I would like you to think about it. It is. It’s horrific. After years of work, the FDA is considering banning it. You can submit your comment here. Shain M. Neumeier, who has been working on this for years, had an op-ed on the torture – and the Judge Rotenberg Center that applies it – in USA Today. How is this legal?” This is one of the first questions people ask when they hear about what happens at the Judge Rotenberg Center, a residential school for disabled children and adults just south of Boston. For decades, JRC has worked off a treatment model of reward and punishment — punishing its clients severely when they misbehave. In particular, JRC is the only program of any kind in the United States to use electric shock as a form of behavior modification. This form of punishment is very different from electroconvulsive therapy, which is used to treat depression; it’s much more like the use of a shock collar in training a dog. JRC aides use two different types of remote control devices to shock students on their arms, legs and torso in response to dangerous or potentially dangerous behavior. The weaker of the two is 15 times more powerful than an actual dog training collar, and has been described as feeling like being attacked by a swarm of wasps. The devices have been known to cause first-degree burns and to occasionally malfunction, shocking someone other than the intended target or activating completely unintentionally. Please read, share, comment, and get this practice banned. I generally start my presentations on police use of force and disability by talking about a deaf man shot in the back. I like to end (or at least end the section), by talking about non-white men killed while wearing ear buds, talking on cell phones, or not speaking English. It’s a way to point out that one major issue – the issue that endangers people with disabilities more than any other – is when police decide to escalate based solely on non-compliance, absent any threat indicators. I call it, when it comes to policing, the #CultOfCompliance. On January 22, 2008, then Officer Mitchell responded to a false burglary alarm and assumed the first person he saw was the suspect. But Christopher Bauer was just an innocent bystander walking home with his hands in his pockets and listening to his iPod. From his moving vehicle, without warning or provocation, Mitchell tased the oblivious teen in the back of the head, causing him to fall forward onto his face. Mitchell then cycled the TASER a second time on the unconscious victim. Bauer suffers permanent neurological complications from the incident, including memory loss. Mitchell told Bauer he tased him because he refused to comply with his command to stop. Officer Mitchell stated that if the hold up alarm was in fact a “good alarm” this personwould be a likely suspect or witness. Officer Mitchell felt it imperative to stop this person and identify him in case the alarm turned out to be a real robbery. Officer Mitchell further stated that if the hold up alarm was “good,” in his experience, hethought the suspect would most likely be armed with a weapon, probably a handgun. Officer Mitchell stated that he decided to use the Taser to stop Mr. Bauer without warning him because Bauer might be armed and might try to avoid apprehension. Officer Mitchell also stated that he wanted to stop Mr. Bauer before he reached a position in the parking lot that might endanger the lives of other civilian pedestrians. Police Officer Andrew Mitchell used more force that was reasonably necessary to stop and detain Christopher Bauer Jr. Whether or not Mr. Bauer was wearing earphones and listening to an IPOD is not important to this hearing. Officer Mitchell was not justified in the use of force to stop anyone. There was no confirmed crime to investigate. Officer Mitchell’s primary responsibility, as first car on the scene, was to respond directly to Jersey Mike’s Restaurant to investigate and determine the validity of the alarm. In doing so he would have discovered the alarm was false and no other action was necessary. Had the alarm been “good” as Officer Mitchell feared, he would have been in a position to render aid to victims, obtain and broadcast a description of the suspect, protect the crime scene, and collect evidence. The page goes on to collect a news report and some documents on the case. It’s a classic example of, as I see it, the worst kind of decision-making and threat-assessment that endangers people. Bauer’s case is collected here on a page dedicated to the death of David “Bones” Herbert, who was told by one police officer to bring over his knife, and shot by another officer for showing a knife. Every year, Western Michigan University, in Kalamazoo, hosts about 3000 medievalists for a giant, sprawling, conference that I call MedievalCon. It has its significant academic context, but it’s also embraced seriously fannish elements (or had them thrust upon it). On Saturday nights, there’s a panel hosted by the “Pseudosociety,” in which academics deliver humorous satirical papers on invented manuscripts or whatever. Honestly, I don’t know. I’ve been to one paper and it involved some nice elderly Irish lady making fun of “student howlers,” or errors students write on their exams, and I’ve never really been into that kind of humor. Instead, I tend to plan a very nice dinner with friends. This year, alas, Pseudosociety hosted two papers that were transphobic. I don’t have details. I am not interested in parsing intent or whether they were really transphobic (on a listserv, a far-right-wing former prof of mine tried to make snide comments about Greek origins and changing the meaning of the word “phobia.” A smart person responded, “Really, what did your Greek teacher say about xenophobia,” and the far-right-wing former prof stopped talking). I am speechless. I have lost my power to speak. Last night not one but two papers were given with hate speech, transgender slurs, that use transgender to belittle medieval castrates and medieval castrates to belittle transgender. Already the next morning, the debates begin: hate speech v. free speech, ignorance v. consequence, a sense of justice v. a sense of humor. The effect of making us funny is that we are not taken seriously, we are not listened to when we speak, and we can’t tell our stories. These attacks have power because they do not occur in a vacuum. Their words take force and meaning because of medievalists who believe that gender variant people don’t belong in medieval studies. Their words take on the force and meaning of laws barring trans persons from public bathrooms; a necessity to learn, teach or attend conferences. Their words take on the force and meaning of those giving women pepper-spray to use against trans people, threatening to beat us, and planting ideas in the head of a 16 year old who recently shot a local trans woman. People have asked me to say something about this. I know they want me to make sense of this; to find some way to make things better. Now, I am speechless and I have no pardons to give; yet I come to this congress on medieval studies because my conscience leaves me no other choice. I come here because 48% of transgender women attempt suicide, because last year doubled the average number of transgender homicides, because parents bury them in clothes and names that contradict their gender identity, erasing all trace of their transgender lives. I sit with my countless dead trans friends and family looking for something to say but I have no words. So I listen. I listen to graves, the ruins of past trans lives, as they whisper to each other. They speak in many tongues from many places and many times. I hope if I learn to understand the dead and discarded trans lives that they might teach me words to say and stories to tell. I come to medieval studies because it is here that we learn to speak the language of the dead from the dead themselves. I come to medieval literature and history because we need their trans stories to make meaning out of our deaths and silences. Conflict is intrinsic to narrative and embodiment. It is not an over-reaction for a transgender medievalist to see the larger war and dangerous threats implicit in what may be pardoned as playful jabs. Yet the power of our oppressors can be used against them and our vulnerability can work for us. By silencing us so publicly, you are drawing others to hear our stories. By sending more of us to our early graves, you are adding to the cacophony of ghosts whispering in the machines of our destruction. By deconstructing our bodies, you reveal the maps for reconstruction written in our scars and sinews. Conflict comes with cost and we are paying it in the lives and stories of our transgender family. But one day that bill will have to be paid. For once we learn to listen to the transgender stories of the dead, each seemingly silent gravestone and medieval text will come alive with the call for justice. I was going to post this yesterday, but was too sick. Below is a tweet from former graduate student in medieval literature, responding to a petulant tweet by a racist UKIP (right-wing English political party) about an actress of color playing Queen Margaret of Anjou. If I’d been able to complete my PhD, it would have been about exactly this – myth solidifying into history, then liquefying into myth again. Everywhere you think there is solid ‘history’ to lean on, it falls out from under you. It’s wrong to try and dictate what roles black actresses can play, whatever the context – but this guy decided to do it using an image from a manuscript I’ve written half a PhD on, unluckily for him. I thought it was a great opportunity to show that the sources we rely on to imagine a golden age of pure “historical accuracy” are often anything but. As ever, the important thing is purpose – it’s not misuse of medieval stuff that matters, it’s attempting to deny work to a black actress. Le Chevalier is handling her sudden twitter fame with good grace and a continued fine sense of wit. It’s been a pleasure to watch. There were, of course, some similar backlashes surrounding Hamilton, in which the founding fathers of American history were re-imagined as people of color. Not to mention Black Hermione. There is, of course, a long history of experimenting with race and, for that matter, gender, in casting of Shakespeare (from which this Margaret of Anjou is drawn, more or less). As many tweeters pointed out, the earliest actors playing Margaret, for that matter, would have been male. I find the idea of Queen Margaret – a French queen tasked with defending the House of Lancaster, as her husband flounders (perhaps due to mental disability) – being cast as a Jewish/Nigerian actress, to be an interesting move for many reasons. Her identity in the plays (I haven’t seen this BBC show) is very much structured around her foreignness to England, as I recall them, and so marking that in ways other than a fake French accent seems like a sharp approach. 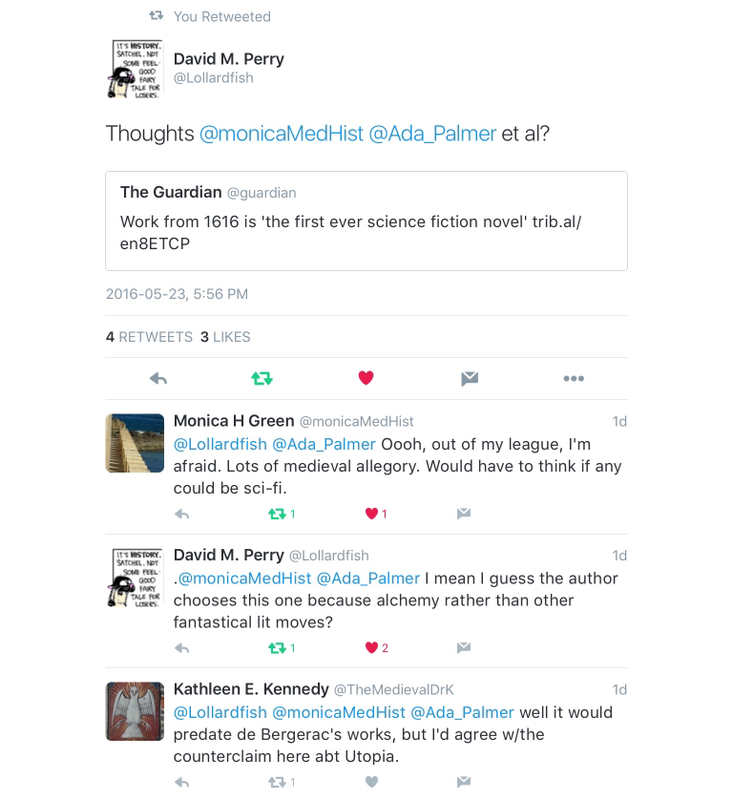 ICYMI, here’s an interview I did around race and representation in medieval fiction. What’s going on here, of course, is yet another proof that representation really matters. The UKIPper knows it, which is why he wants to keep the memory of medieval Europe lily white. As experts, we don’t have to let him get away with it. The celebrity with disabled sibling genre of story tend to be pretty awful. The celebrity is asked about their sibling and, in response, the celebrity says things like overcome, inspiration, and other usual platitudes. This is partially because that’s how we’ve learned to talk about disability, partially because celebrities sell clicks and so interviewer isn’t really that interested in the disabled individual as a person, and partially because cliches are safe (as Bull Durham taught us). Adam Newman, however, directed me to this story about a young player for the Dodgers and his older brother, Champ, who has Down syndrome. This is a story in dialogue, with both men given equal time to talk about their relationship. The picture that emerges is meaningful reciprocity with some depth (especially given the format). Champ talks about his relationships with baseball players, his job, his aspirations, and his thoughts about Down syndrome. It’s a really nice model of what’s possible, especially nice to see in this context.